It the full moon tonight, while some people will be having rituals and others treating like a normal night I will partake in a family tradition. Watch the crazy people. I think family traditions are the best especially if you come from a funny family like mine, some days just turn into random nights of enjoyment and gruesome obsession. I live on a main road in this city and very close to some not so welcoming areas of town, we have crazy people walking by the apartment nightly but you know what they say about the full moon. I'm charging my video camera as I type because my dad wants to see the videos and compare later. Last month we saw everything from people on stilts wearing wolf costumes to random zombies...yeah you read right zombies. Add in a few drunks and people on random drugs or yelling about the end of the world and you start to wonder why anyone would want a television. Another odd thing happened today, near Niagara falls, a plant shaped like a phallus bloomed for the first time ever in Canada the story can be found here . Apparently it smells like rancid meat but the bloom should be gone by Monday. I think that maybe the plant tried to tie it's performance to the full moon but Anima just laughs at me when I mention it. *witchy alert* On a side note mother nature decided to give me my little red gift just in time for the full moon, so I guess it's time to break out the ginger to make this a little faster and less painful. Ginger tea will be my drink of choice for the next 5-7 days. I hope what ever you have planed for tonights full moon goes well. I'm off to pop some popcorn for mine. 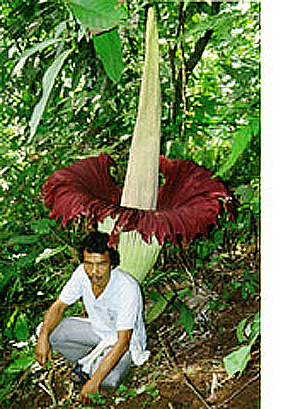 I found a picture of the type of flower! Wow, I didn't know about the healing powers of ginger - need to remember that, thank you! My kitchen always has ginger as it is quite a versatile root when it comes to healing. I might do a little post later tonight about how I use the stuff because when teaching people about how to heal with plants I make sure that they know how to use ginger.